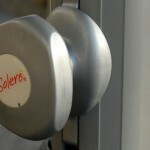 We from Solero are happy to assist you when buying a parasol. 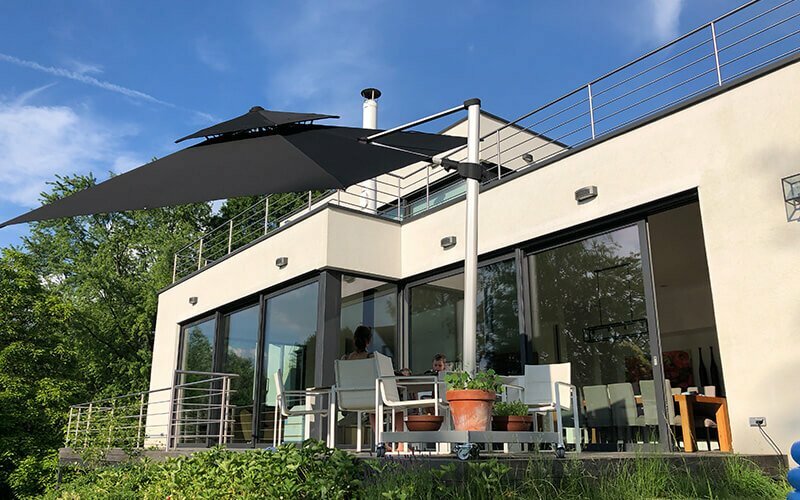 The purchase of the right parasol is not always easy, and depends on various factors, such as use, ease of operation, size and other preferences. 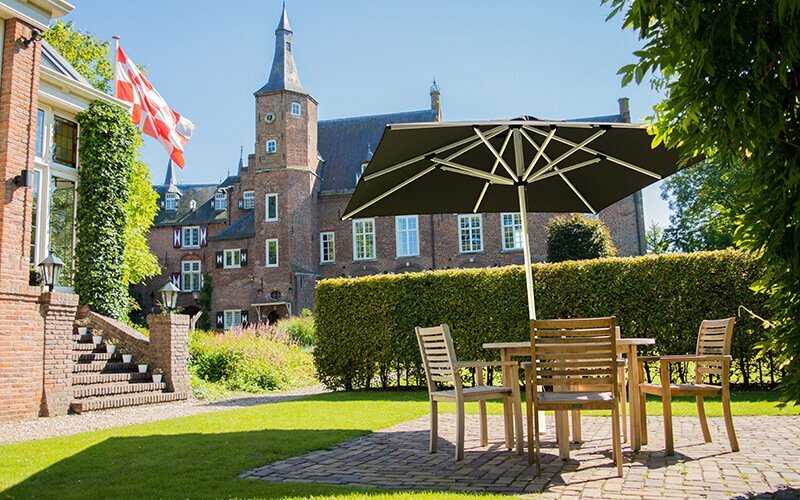 We have a huge selection of parasols, and each parasol is suited for a different purpose. A round, square or rectangular parasol? Making a decision between a round, square or rectangular parasol depends on your taste and your wishes. Each dimension has their own uses. 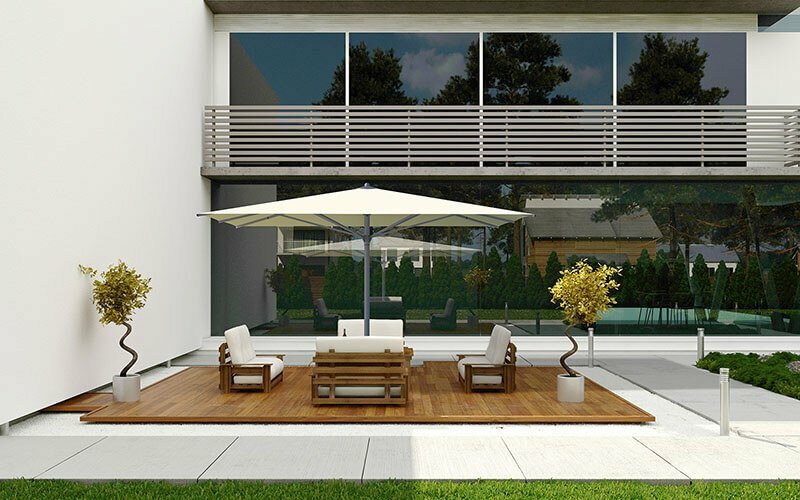 The advantage of a square parasol compared to a round parasol is that square parasols can be connected with gutters, which is also the case for the rectangular parasols. This way, a large area can be fully shaded. 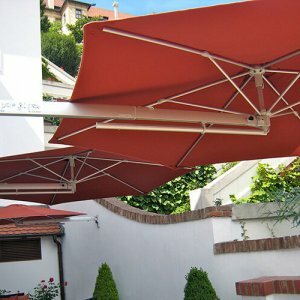 You can also connect square or rectangular parasols with gutters, too. 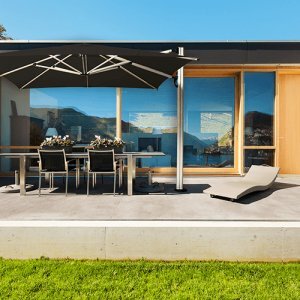 With a cloth or rain gutter, your entire patio is protected from the sun and the rain. Especially for the hospitality industry, it offers a tremendous outcome. 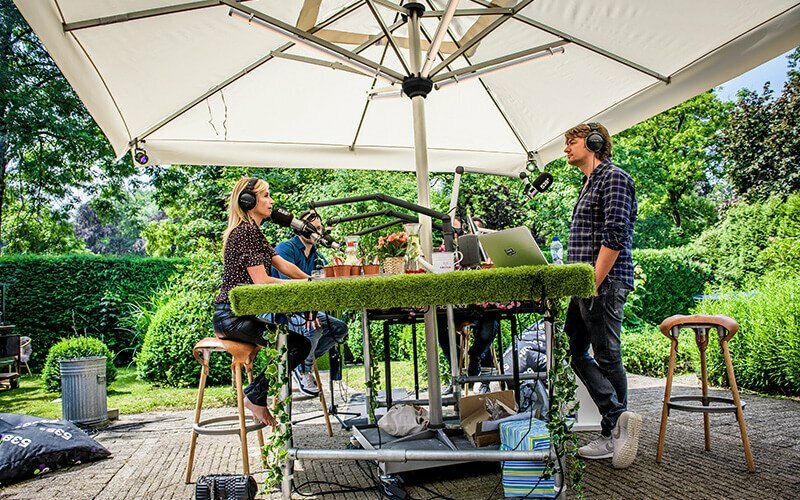 Guests can sit on the terrace during bad weather, and the rainwater finds its way down along the gutters – leaving your guests dry and satisfied. The advantage of a round parasol is that the ribs are equally long. 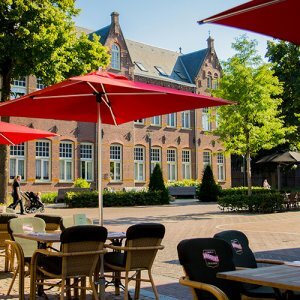 A square parasol has long and short ribs, in order to get the square shape. 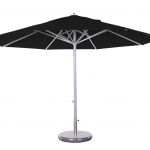 Because the round parasol only has short ribs, it generally has a higher closing height. That’s why a round parasol generally opens and closes above the table. An example of a round, telscopic parasol that closes above the table is the Solero Presto. 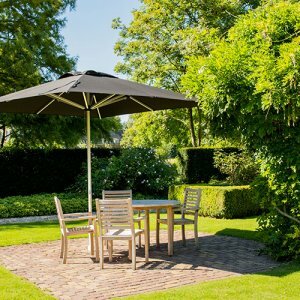 If you are considering buying a round parasol, then be sure to check the Solero Presto. 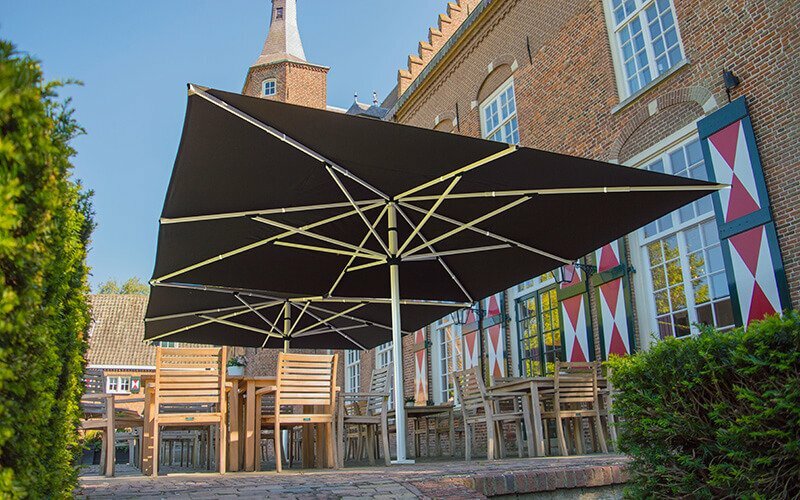 Solero also has a number of square umbrellas which close above the table, because of their telescopic masts. When they close, the top of the mast raises up. Because of this, the parasol has a higher closing level. When a parasol has a telescopic mast, it is indicated on the right of the page. 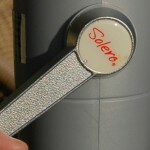 Examples of telescopic square umbrellas which close above the table are the Solero Presto, Solero Maestro Prestige and Solero Basto. Another important aspect of the parasol is its operation. 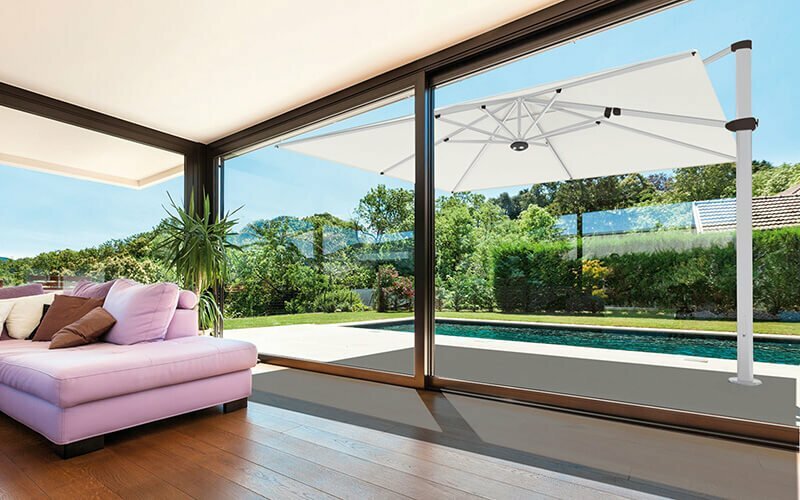 The operation methods of a Solero parasol can be divided into three categories. 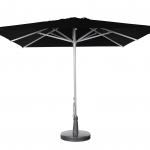 A parasol with a ‘push up’ or ‘pull down’ system is very simple to operate. 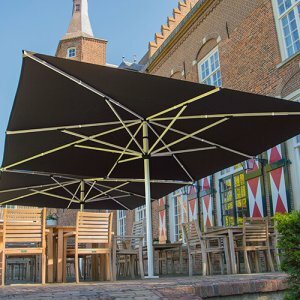 The operation of these parasols speaks for itself – when the knob is pulled down, you open the parasol, and by pushing up this same knob, you close it. 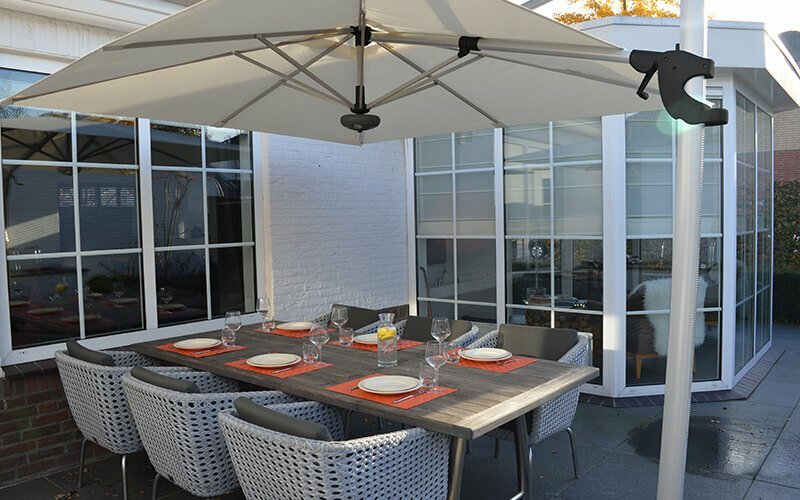 Solero parasols are designed in such a way that opening and closing works with minimal effort. An additional advantage is the simplicity of the design. 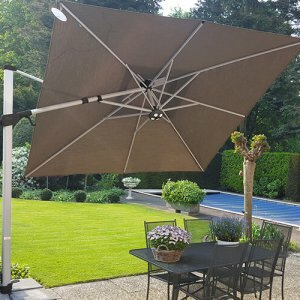 A push up/pull down system doesn’t have moving parts, which improves the durability of the parasol. 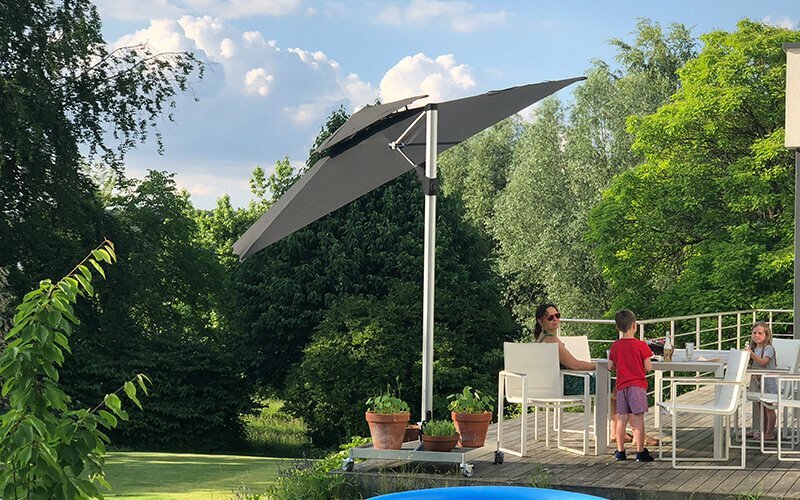 If ease of use is a high priority when you are considering buying a parasol, take a look at the Solero Sublimo (200*200cm) or the Solero Presto (round 400cm or 330*330cm). A parasol with a winch is often used with large parasols. A parasol is equipped with a winch when a push up/pull down system becomes too heavy to handle. A parasol with a winch is very simple to operate. With an included handle, the winch is turned and the parasol opens or closes. The winch and its cord are of very high quality, and have been tested for long term use. An additional advantage of a winch is that it is removable for the hospitality industry. This way visitors cannot open or close the parasol by themselves. 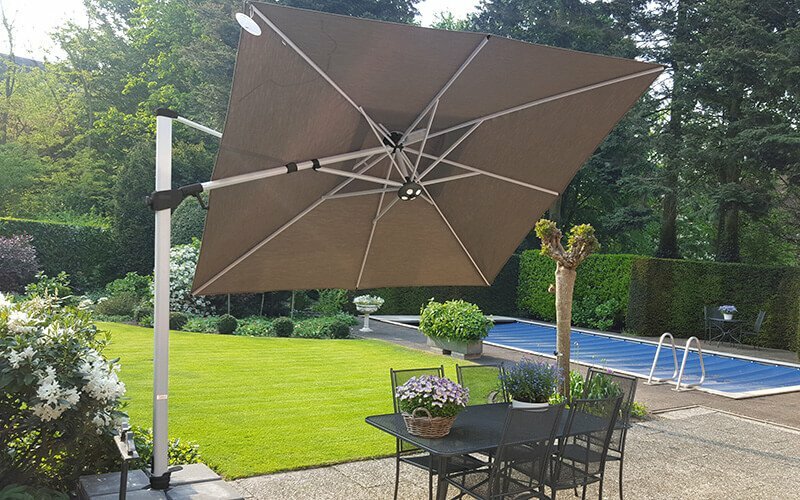 If you are considering buying a parasol equipped with a winch, take a look at the Solero Maestro Prestige, Solero Maestro Prestige(400*300cm and 400*400cm), or the Solero Basto (400*400cm and 500*500cm). 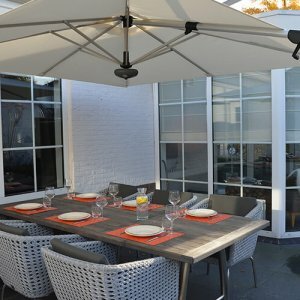 The Solero Patio has a parasol cord supported by an external double pulley system. You can open the parasol by pulling the cord downwards. 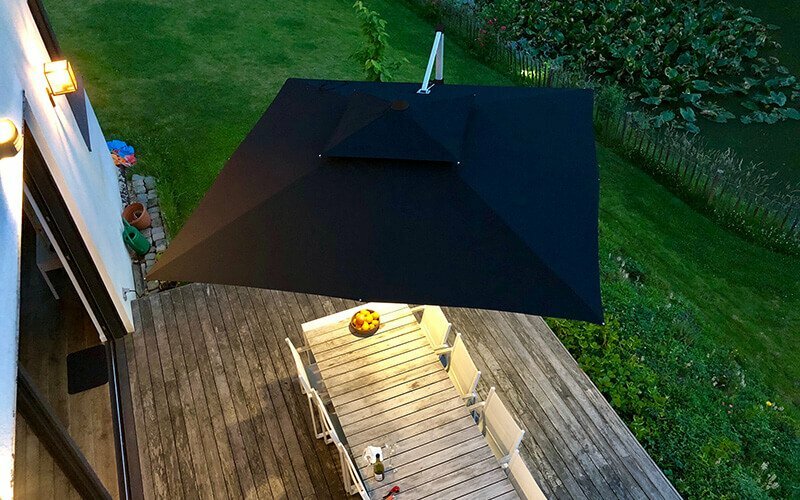 The chief advantage lies in the simplicity of the design, and because the system is located on the outside of the parasol, anyone can operate it. For extra convenience, the parasol is fitted with a ‘frog’ at the lower part of the mast, where you can clamp the string of the parasol. Once the parasol is opened, a safety pin can be inserted through the frame so that the parasol cannot fold in if the cord would comes loose from the clamp. 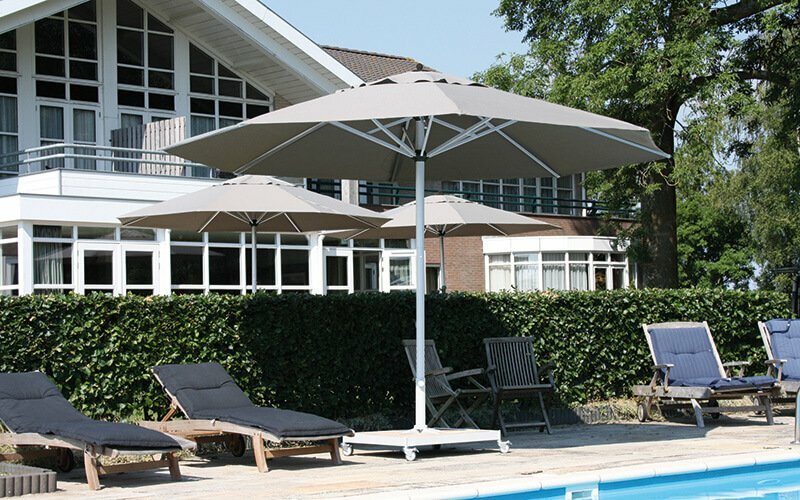 Solero parasols are distinguished by the quality of our cloth. All our cloth is waterproof and not only protects against rain but also against the sun. The water column of our cloths is 500mm ­– this means that the cloth can handle 50 cm of water per square centimeter without leaking. Solero delivers only colorfast cloths. During the coloring process, the Solero O’Bravia cloths are colored right up to the core of the fiber. This makes the cloths protected against discoloration. A Solero parasol will stay the color you bought it in! This is in contrast to most of the polyester cloths of other suppliers. Solero gives a four-year warranty on color on our Solero O’Bravia cloth. 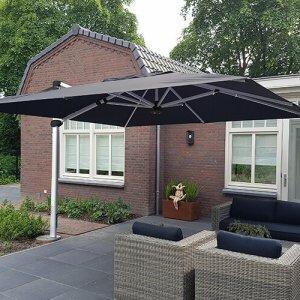 If you want to have a parasol printed with custom text or logos, then a parasol with flounces is the what you need (a flounce is a vertical flap under the parasol). 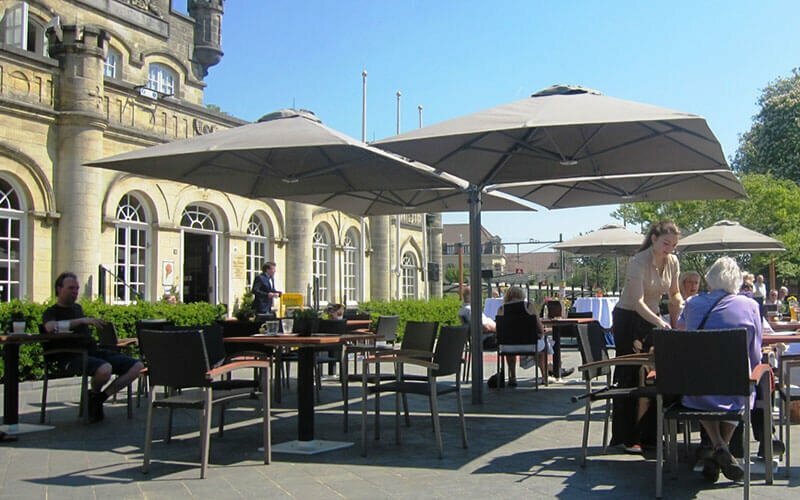 One parasol with flounces is the Maestro Prestige, making it one of the best-selling parasols for advertising and hospitality. Choosing the color of the parasol depends on your personal preference. All our cloths have a UPF 50+ factor. This means that the cloths filter 100% of UV radiation. An exception to this rule is cloth in “Natural” and “Off-White”. These cloths have a UPF 30+ factor (which filters out 97% of UV radiation). 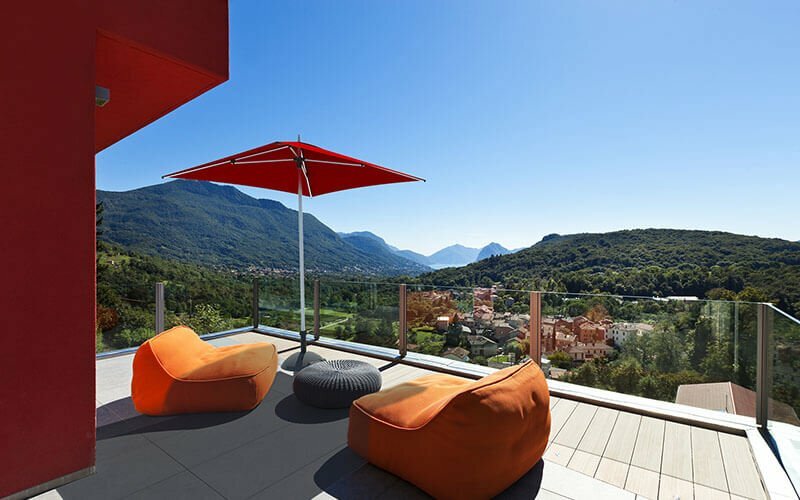 There are different ways to place a parasol on your terrace. Below we describe a number of possibilities. 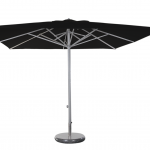 A parasol can be attached to a parasol base. 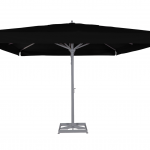 Parasol bases are available in various shapes and sizes. 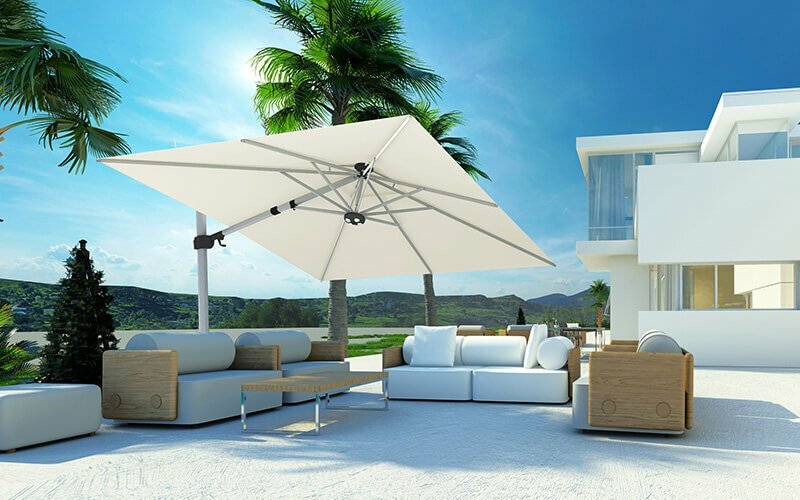 Most Solero parasols can be delivered on different bases. 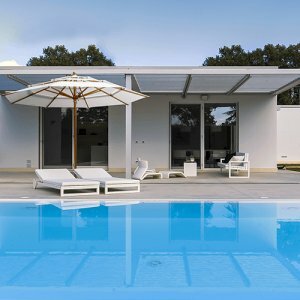 A frequently used base for large parasols is a base with tiles. 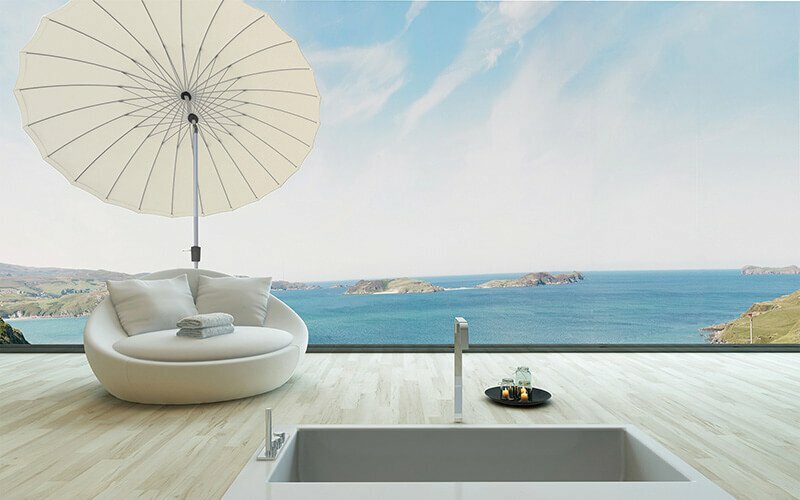 A Solero tile base offers space for 4 to 8 tiles, making it easy to increase the weight. Due to the width of the surface, the tile base is very stable. Besides that, a tile base can be equipped with double swivel wheels. 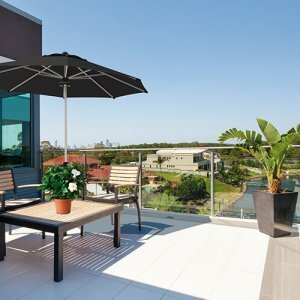 This way, you can easily move the heavy parasol along your terrace. 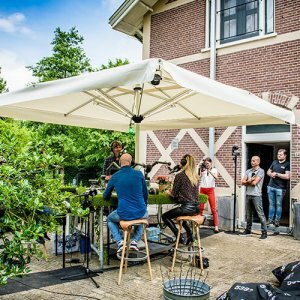 Ideal for a flat terrace, or if you have to ‘pack up’ your restaurant terrace in the case of events or markets. 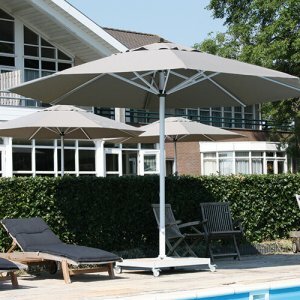 These double swivel wheels are equipped with a brake, which holds the parasol in place. 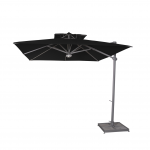 A parasol can also be placed in a granite or concrete parasol base. A granite base has a rough look but a possible downside is that this base is difficult to move due to its weight. Under the granite and concrete base are two wheels, so it is mobile, but the base remains very heavy! So keep this in mind if you are considering buying a parasol base. Besides in a base, it is also possible to place the parasol in a ground anchor. 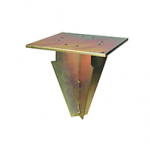 A ground anchor is a stainless steel anchor that is poured into your terrace with concrete. The anchor is sunken evenly into the ground, and will not become a problem in the winter when the parasols are taken out. Another advantage of a ground anchor is that you don’t need a base on the terrace. This way, the base is not in the way of your tables or chairs, and the least amount of surface area is used. Buying a parasol depends on several factors. Of course, the most important one is your personal preference. Choose a design that fits your needs and a color that appeals to you. 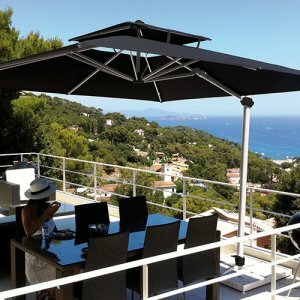 If you are not sure which one to choose, then we would be happy to contact and assist you in buying the right parasol. You can also buy our parasols from an official Solero dealer in your neighborhood. 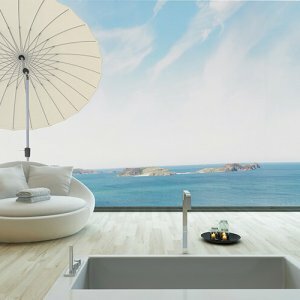 Our dealers have the Solero parasols standing in their showroom. 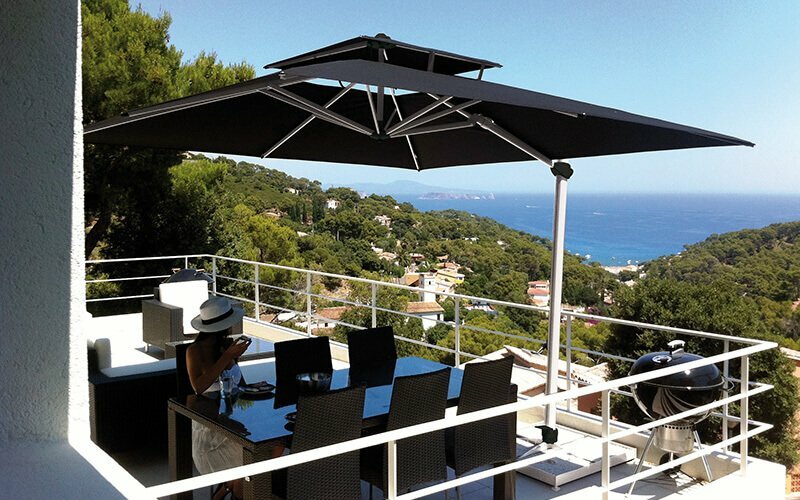 Please contact us to find a dealer close to you, and experience the quality of a Solero parasol! 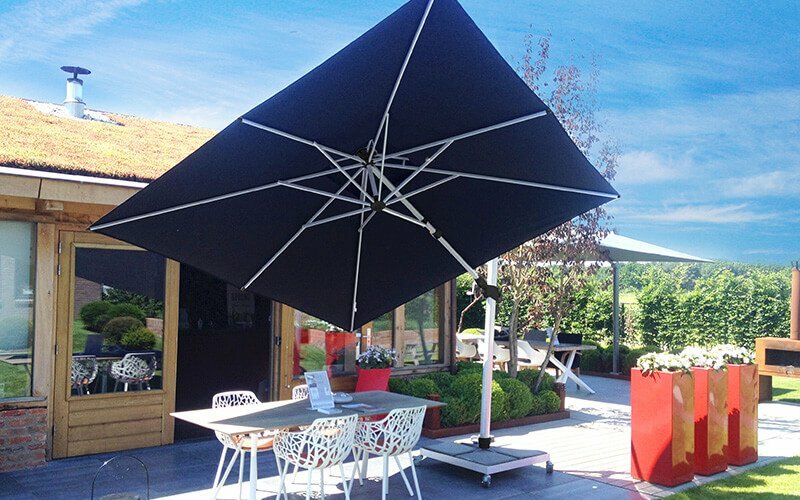 It is also possible to order the Solero parasols directly through our online shop.